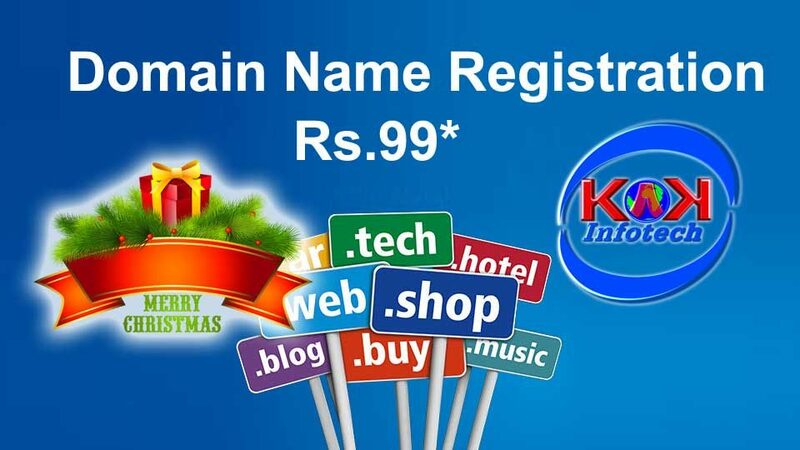 KakInfotech.com offers domain name registration Season Sale starting from Rs. 99 for top level domains to choose from wide variety of lists. Domain Name Registration Season Sale is the 1st step to start your online business. Grab you Business name starting from Rs. 99 Only. This is the effective price of domain name registration with us. Once you register the domain name at standard rate you will get cash back in your account which can be used for any future purchases with us for any product or services. One of the most widely chosen name is .com and it is very popular also. Major advantage is to get the domain name free with any of the other services like Linux hosting, website Design services. All these services gives you an opportunity to get your name FREE with any of the hosting or Dynamic Website Design Services. Getting a domain and looking to get an email id for business is also important. We offer a very economical Email package which starts from Rs. 22 Only. You can upgrade this 2 GB plan upto 50 GB. Yes, once you are ready with your website content we can offer you template Website Design if you do not have a budget, it is all inclusive of domain, hosting, email and readymade pages for your website design Rs 22 per month. This will help you to get your business email and communicate professionally with your clients. If you already ready with website content, we will suggest you to go for a Dynamic Website design which gives you all privileges to maximize your business as you can easily change your content from time to time and 24X7 accesses to your website is available with you. Get your dynamic Website which starts from Rs. 555 per month. Domain name registration Season Sale opens a very wide area of domain choices for TLD including.com, net. Org, in.co.in and many others in this race. Many other TLDs like .fashion, .top, .bharat are many different TLDs also available for registration. Accepting different names if not available for.com, nowadays we are accepting 150+ TLD and soon we are adding more to this. So, we always get confused that we are not getting the correct names, but now a wider variety of choices are available that we can always provide a list of maximum choices of your names if you do not find with the popular choices with .com.